This renamed and revamped annual publication annotates each substantive provision of the Competition Act, with synopsis of key applicable cases and expert analysis and insights. Developments in competition law continue to be a critical aspect of the Canadian legal landscape for any business that operates in Canada. 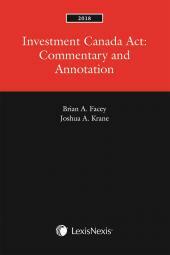 This renamed and revamped annual publication annotates each substantive provision of the Competition Act, with synopsis of key applicable cases and expert analysis and insights of Brian A. Facey and Cassandra Brown, both Partners with the Competition, Antitrust & Foreign Investment group at Blake, Cassels & Graydon LLP. 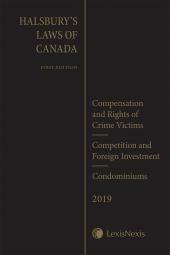 Along with a detailed Year-In-Review in the Preface, this annual publication also contains the full text of the Act and related legislation and key Competition Bureau Guidelines, making it a valuable resource for corporate counsel, legal practitioners in private practice and business executives. Extensive amendments to the Competition Act from S.C. 2018, c. 8, s.
When it comes to advising on advertising and trade practices, or ensuring compliance with competition legislation, regulations and guidelines, make sure you have this reference at hand! Cassandra Brown, B.Comm., B.C.L.,LL.B., is a partner in the Competition, Antitrust & Foreign Investment group of Blake, Cassels & Graydon LLP. She advises on all aspects of competition law, including mergers and acquisitions, joint ventures, distribution practices, criminal and civil investigations, and corporate compliance. Ms. Brown also advises on foreign investment review under the Investment Canada Act. She is the co-author of Canada’s leading text book on merger review, was an adjunct professor of competition law at Osgoode Hall, and is ranked in The Legal 500 Canada 2018 (Competition and Antitrust) and as a future leader by Who’s Who Legal: Competition (2018), which profiles the foremost practitioners in the competition community aged 45 and under. Brian A. Facey, B.A., LL.B., LLM., is an internationally recognized competition and foreign investment lawyer and Chair of the Competition, Antitrust & Foreign Investment Group at Blake, Cassels & Graydon LLP, widely regarded as a leading competition law practice in Canada. For 25 years, Brian has advised clients involved in hundreds of regulatory matters, including foreign investment reviews, cartel cases, class actions, and distribution and advertising matters. Brian is listed among the Top 10 Most Highly Regarded Individuals in North America by Who's Who Legal: Competition 2016, and is the only Canadian lawyer to receive this distinction. He has been described by international ranking publications as the "most highly nominated lawyer in this practice area in Canada" and "one of the world's leading practitioners in this field". Brian is past chair of the Canadian Bar Association's National Competition Law Section and was an adjunct professor for more than a decade. 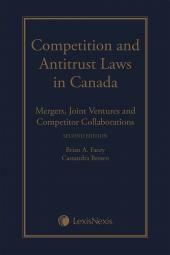 His treatises have been cited by all levels of courts in Canada, including the Supreme Court of Canada for his work on efficiencies and strategic mergers.